Fredrik Sjoberg is a Swedish Entomologist, a collector of hoverflies and inhabitant of an island. I didn’t read the reviews of the book before I bought it; suffice to say it was a book written by a man obsessed with hoverflies and it had five star reviews. What more did I need to know? This, however, is not a book about hoverflies. It is not a book about insects. It is a book about obsessions, collecting, being an entomologist, living on an island, following your passion, and, to be honest, being what most people would consider eccentric. The theme running through the book though, is actually the Fly Trap, or, rather, the inventor of the standard issue insect trap – Rene Malaise. Rene Malaise was also a Swedish Entomologist. Malaise also collected flies, thousands of them. And art. He spent years in the Kamchatka region of Russia, even when his fellow travellers returned home. Later he visited Burma, and collected more flies. In between he collected a lot of art. In what is a wonderful book, the author interconnects his life with that of Malaise; what it’s like to live in remote areas, how the author was really not an explorer, despite many trips abroad, how it feels to find insects new to an area, why collecting can become an obsession and, finally, reveals what is probably his own obsession. With Rene Malaise. Despite this, I feel I know a lot more about Rene Malaise, but not much about the Fredrik Sjoberg. I found the book difficult to get into at first – perhaps it needed more insects for me. I didn’t know where it was headed or why. Then I read the second half in an afternoon, and it was a wonderful read. It didn’t matter that it meandered with no obvious purpose, or that hoverflies were not the main attraction (although some more insects would have been a bonus). It is a charming book, and one that I was disappointed to finish (although the end was a little weird). It is one of the few books that I decided straight away that I would read again. Five stars if you like your natural history writing a little odd. 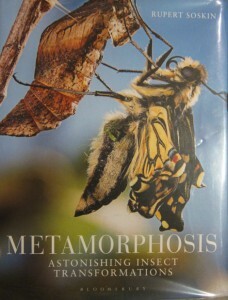 Metamorphosis – Astonishing Insect Transformations – the subtitle definitely describes the content of this book by Rupert Soskin. Insects – often overlooked, thought of as bugs or pests, possibly with the exception of butterflies (although the cabbage white butterfly springs to mind) but with around one million species known and named. Untold numbers are still to be found. Contrast that with birds – ten thousand; mammals – five thousand; even reptiles and amphibians only manage fifteen thousand between them. It is no surprise then that there are many things that even the most fervent entomologist can still learn about this diverse class of creatures. In Metamorphosis the author beautifully illustrates an area that I haven’t yet seen covered in another book – the transformation that insects must undergo to get from an egg (in the majority of cases) to the adults of the species that we are usually most familiar with. This lack of familiarity is despite the fact that the adult stage is usually the shortest with many living days or weeks but spending years as a larva or nymph. 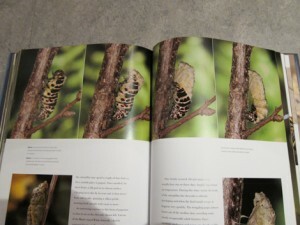 The book is essentially in two parts – those insects that go through several instars (stages); looking to some degree like miniature versions of the adults, and those that undergo a complete transformation from what is essentially a tube of innards to something completely different (the most obvious example being the change from a caterpillar to a butterfly). I started off wondering so much of the book was devoted to the first class of insects; the hemimetabolous insects (the young of which are called nymphs) when the changes they go through are nowhere near as marked as those of the holometabolous examples. But, as the author explains, the only way that an insect can grow is to shed its skin – and, in some cases (such as some of the shield bugs) I don’t think many people would match juvenile with adult. What makes this book a joy to read are of course the photographs. 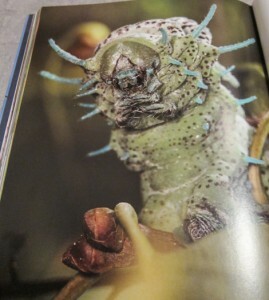 Where many books show the adults in all their glory, Rupert Soskin shows the different stages in the life of the insect, from egg to larva / nymph, to chrysalis and adult. The photographs are beautiful and I can only begin to wonder at the patience of the author as he waited to get the shots. Within the different chapters there are of course notes about the insects and their lives – after all, the photos only tell half of the story. In some cases he has even shown the scale of the insects – a very helpful device. I was a little disappointed at first when I saw how many of the insects are from outside the UK and therefore something I am never likely to see (no matter how much the climate changes). But, they were fascinating – I was completely won over by the stick insects and the Peruvian Horsehead Grasshoppers. All the main orders are included from grasshoppers to mantids, dragonflies to beetles, butterflies, moths, flies bees, wasps to hemiptera. I began to wonder how he decided what to include and also what didn’t make the final cut. I thought that the sections on the butterflies and moths were interesting choices, showing the changes in size and coloration of the caterpillars and the resulting adult. But, my favourite photo of all (other than the horsehead grasshoppers, mantids and stick insects) had to be the female wasp removing water from her nest after the rain – just fantastic, one of the best insect shots I have seen and behaviour I hadn’t heard about. 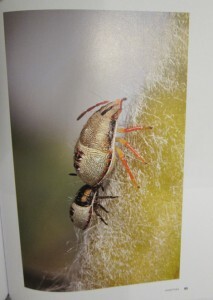 Just one of the many interesting aspects of insect life that Mr Soskin managed to capture and share. 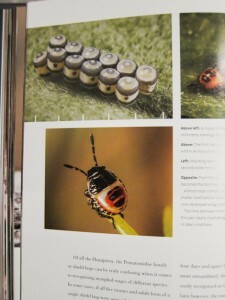 I have only two real complaints about the book; I would love to have known more about how he took the photos – he has a small section about this but it was very short on actual details and I would have liked it to have been twice the size with more fantastic insects and beautiful photos (this is of course selfish as the book is 250 pages long). 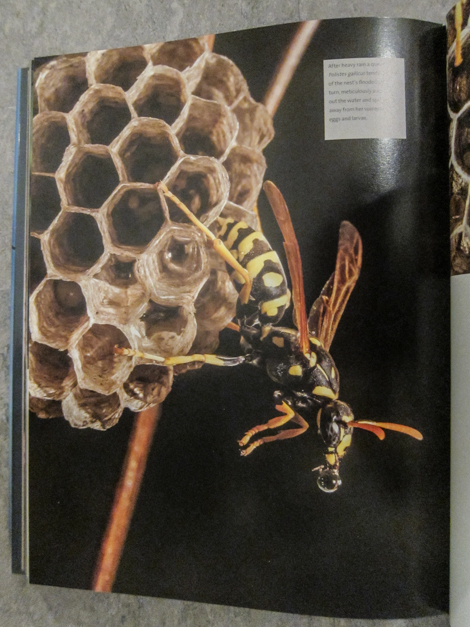 This is a beautiful coffee table book that I could look at again and again, and a starter for anyone interested in insects showcasing some of the less well known stages of their lives. Whilst it is only a starter, it does include some further reading suggestions that will be making an appearance on my birthday wish list. Many thanks Mr Soskin for creating such a wonderful book (and to Northampton Library for stocking it so I didn’t have to wait until my birthday to read it). This is Charlie Elder’s second book. 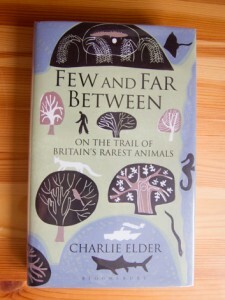 Following on from his earlier ‘While Flocks Last’ (which I own and now plan to read again) where he went around the UK to find forty birds on the UK red list which means they are in serious decline, the author now gads around the UK looking for 25 rare or hard to find creatures. As well as birds he’s included insects, mammals, amphibians and marine life. Charlie Elder is undoubtedly very excited by nature and keen to bring to our attention the plight of many of our scarcer creatures; you have to be over a certain level of enthusiasm to spend time sleeping in your car, endure various boat trips to islands to find black rats and to get up at the crack of dawn to go scuba diving in the sea off the south coast of Britain. 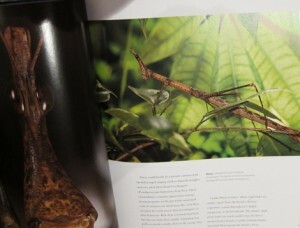 The scarce creatures chosen to feature in the book, whilst they do deserve to have that descriptor, are, as the author points out, entirely random. And, this is the problem for me. The narrative just doesn’t seem to flow in the same way that other, similar books such as Patrick Barkham’s excellent Butterfly Isles or the authors aforementioned While Flocks Last. His enthusiasm just didn’t come out of the page and grab me, it didn’t make me want to find out if he spotted all of the 25 beasties on his list. Whilst there were some interesting bits of information about the animals in question, it almost felt like a book about the hardships the author endured to go and see them – which of course he decided were all worth it in the end. If I was to rate the book, I would sit on the fence and give it three stars out of five – not bad, but it did seem as though the author was trying to think of subject matter for another book rather than already having a list of creatures he wanted to see before it was too late. I promised this year that I would learn more about bees and butterflies and not buy any books. Then I found a copy of Ruary Mackenzie Dodds’ book at a reduced price and all my good intentions went out of the window (this was a book that was already on my to read list). This is not a book about dragonflies though. It is a book about the author pursuing a dream and establishing a dragonfly sanctuary and, later, a dragonfly museum and, bizarrely, a museum of old farm and estate equipment. 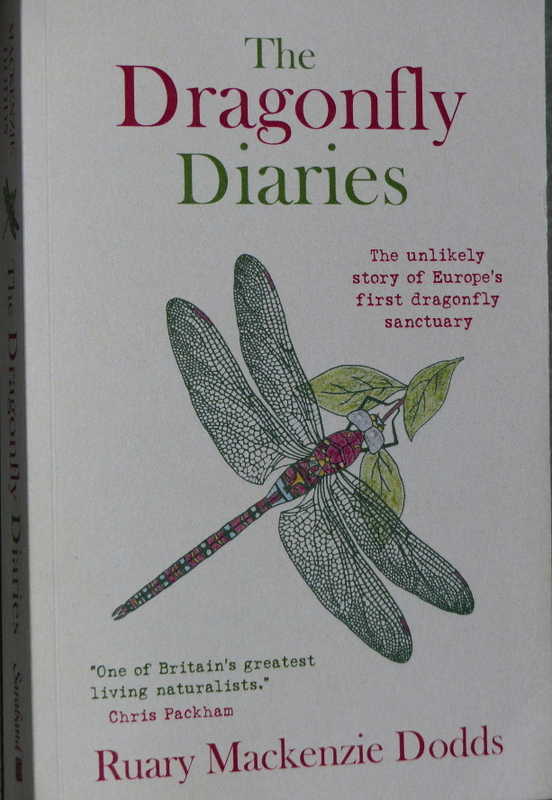 Don’t get me wrong, the dragonflies get many mentions, and there is some information about them, about their requirements and they really are the author’s raison d’être but if you want to learn about dragonflies then this is not the book for you. After saying what it isn’t, then it is only fair to say that what it is is very engaging nature writing and story telling. Ruary Mackenzie Dodds had what many would call an epiphany when out taking photographs near a canal in London during a lunch break when a dragonfly landed on his shirt. Before that moment, he’d never even noticed them. Over the next few years, after discovering that dragonflies were under threat, he came up with a plan to create a dragonfly sanctuary. It helped that his girlfriend was the niece of Dame Miriam Rothschild who happened, along with her son, to own the large estate that once belonged to Charles Rothschild who created what has now become the Wildlife Trusts. In addition, being an incredibly well known entomologist, Miriam Rothschild also knew anyone who knew anything about dragonflies. Whilst this was probably the main reason that the venture got off the ground, it required an awful lot of hard work, vision, cajoling and recruitment of volunteers to get the sanctuary off the ground and this is the story of how he went about it. 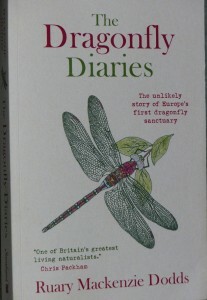 By the end of the book, twenty three years later an awful lot had been achieved including the creation of a charity, the restoration of vast amounts of farm machinery, not to mention one of the first sets of electricity generating equipment circa 1900, and a lot of education of the public about dragonflies. Most remarkable is the ability to attract funding and volunteers from all walks of life, and to keep them volunteering (although it appears there was more than a bit of luck preventing quite a few accidents). All in all this is inspiring stuff, and whilst most of us cannot create anything on the scale of the author’s achievements, it did make me wonder just what I could achieve. Hmmm, time will tell. In the meantime, the wonderful writing style has at least motivated me to get blogging again and to dust off my Field Guide to the Dragonflies of Britain and Ireland. I bought this book specifically to fill a gap that I discovered in my knowledge following my summer of watching the common terns at the country park last year. I became intrigued by the terns, including the black terns that I saw, and wanted to learn more. The book starts with some general chapters, before moving on to individual chapters about each of the five tern species that breed in Britain and Ireland (I didn’t even know there were five). The first chapters cover the tern family generally, followed by their breeding behaviour and biology, food and foraging techniques, migration and also a history of terns within the British Isles (not good reading – we nearly wiped them out so we could put them on hats). 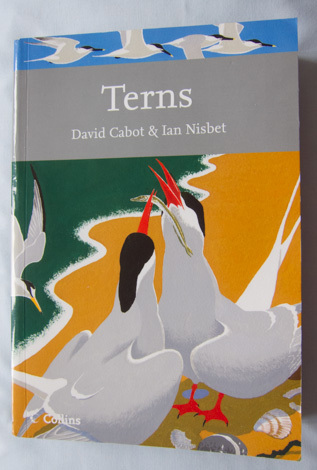 The book finishes with some further information about the terns that are occasionally seen in Britain and Ireland and some notes about conservation projects. As well as lots of really interesting information presented in a clear and informative way, the book is packed with stunning pictures. My one small criticism is that there is quite a bit of repetition from one chapter to the next, and perhaps the occasional visitors to the UK could be included in the chapter of the tern they are most closely related to. But these are minor criticisms of what was a fantastic book. When do the terns first arrive, are they paired before they get here, can I tell the males and females apart by their behaviour in the air, do they defend their territory from when they arrive. Then, hopefully there will be eggs laid, possibly a couple per nest – how long to hatching, if the bad weather comes will they try again, how many of the birds are non-breeding (apparently they often come to scope out a successful feeding ground the year before they are ready to breed), can I tell the different calls apart, how often are the chicks fed, when are they left alone and how long to fledging. Then, there is the question of feeding – what do they feed on and how do they catch it. Finally, how long until they leave and do they all go (adults and chicks) at the same time. So many questions to be answered – I think I might have a busy summer and perhaps it is as well that it is only the common terns that breed inland in the UK!